ehs Compliance e-Newsletter service - Tavares Group Consulting Inc.
Is your organization up-to-date with your legal and “other” requirements? 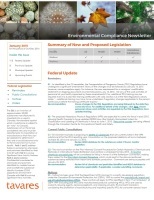 Find out about new and proposed environmental and health & safety legislation, including associated implications to your organisation in our quarterly electronic newsletter service. Meet your ISO 14001 and OHSAS 18001 requirements to identify and have access to the applicable legal requirements and take these changes into account when establishing, implementing and maintaining your management system(s).